Looks like mahogany to me too. 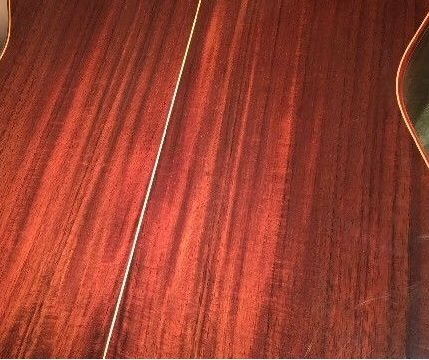 I might venture to say Sapele, as you tend to see those lighter streaks, but definitely looks like a mahogany sort of wood anyway. 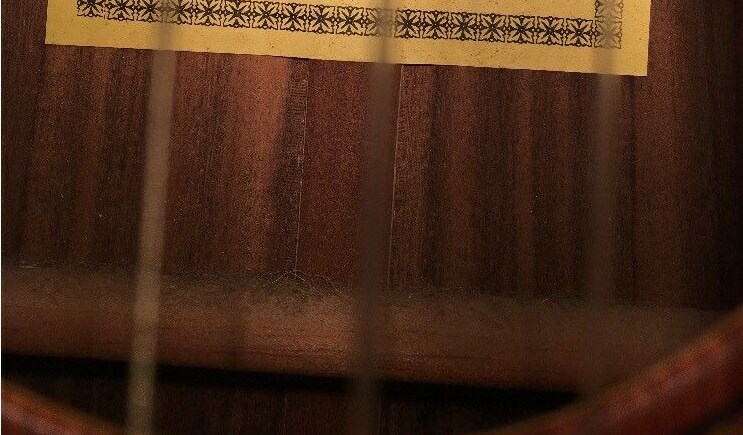 grap, can u take a piccie of the inside - through the soundhole ? It's either mahogany or sapele. It's difficult to tell them apart when they've been quarter cut. Looks like 70s-school-desk-mahogany to me. Wow... you went to a posh school! remember when the all mahogany bodied guitars were marketed as 'budget' models ?. I got a 'slab' of south American mahogany from the old railway ticket office counter when it closed. back on topic - note the difference with the unstained interior - could be one of many mahogany substitutes - i.e. not swietenia mahogoni maybe African (Khaya ivorensis). Definitely. I don't think the teachers who were escorted by the police into my 1970s South Wales comprehensive every morning would've described it as posh. When I bought my current Les Paul I looked at the back of it and was immediately transported back 40 years, in fact I still get the urge to carve "Sharon is a slag" and "CCFC" in it. Does this provide any clarity? thats better grapp - it's rosewood prob Indian. Clearly rosewood. It’s amazing what a difference wrong colour balance and contrast in a photo can do! Really appreciate the help all. I ended up buying this classical from one of the 'cash converter' type shops. It was purchased new in the mid 70's and sold to the shop by the original owner's brother on his recent passing. All solid, no cracks/splits and with ebony f/b and ceder neck. Plays really nicely and sounds wonderful with a new set of Oasis carbon strings. A total and utter bargain.. Thanks again to you all - you helped make it happen and I appreciate it!